Frans van Buchem - Seven Countries Study | The first study to relate diet with cardiovascular disease. Through Ancel Keys’s early contacts with Dutch nutritionists, Professor M.J.L. Dols and Professor Cees den Hartog, and the secretary of health Professor Pieter Muntendam, Professor Van Buchem (1897 – 1979) was named Principal Investigator of the Zutphen Study. Van Buchem obtained his MD in 1921 and his PhD in 1924 from Leiden University. The Nobel laureate Professor Willem Einthoven was the supervisor of his PhD thesis. He became Chief Physician in Internal Medicine of the St Elisabeth Hospital in Tilburg (1929-1945) and professor of Internal Medicine at the University of Groningen (1945-1959). In 1954 he diagnosed a patient with an uncomom familial systemic disease of the skeleton, hyperosteosis corticales generalisata familiaris. In 1955 he published in Acta Radiologica an article about this disease, later called Van Buchem’s disease. 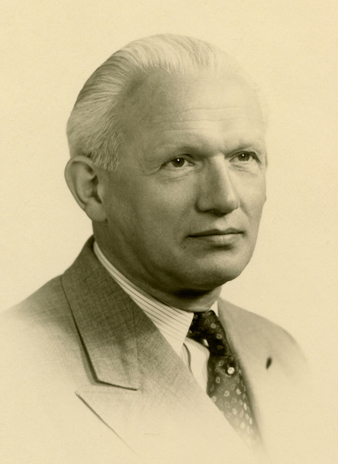 Van Buchem took on direction of the Zutphen Study on retirement in 1959. Uniquely among the Seven Countries cohorts, Van Buchem organized annual surveys of risk factor measurements and physical examinations in the Zutphen Study between 1960 and 1973. In collaboration with professor Cees den Hartog from Wageningen University he also carried out detailed dietary surveys of the Zutphen cohort in 1960, 1965, and 1970. Van Buchem was principally a clinical investigator. For example, he found in the Zutphen Study a participant with a consistently very low serum cholesterol level and after a detailed clinical investigation he described this case of familial hypo-beta-lipoproteinemia in the American Journal of Medicne in 1966. Van Buchem was a member of the Royal Netherlands Academy of Arts and Sciences, a member of the Belgian, the French and the International Society of Cardiology Society and President of the Netherlands Society of Cardiology. Read more about Frans van Buchem at Wikipedia.